Contains all of the forms you need to file, plus envelopes, in one convenient set. Easy ordering, easy filing. 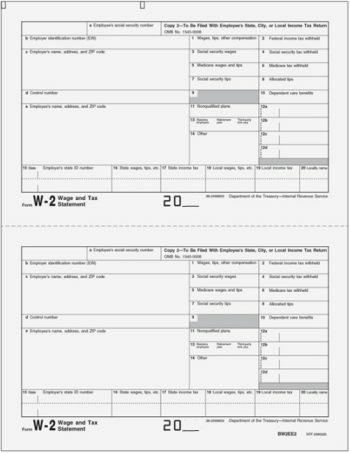 These Official W-2 Forms have 2 of the same form on each sheet. Minimum of 10, order in any increment of 10 employees. Easy to order, easy to print! Convenient set of pre-printed W2 forms with matching envelopes. Everything you need to print and mail W2 forms to employees is included. Select the number of parts and type of envelopes you need with a quantity equal to the number of employees you have. 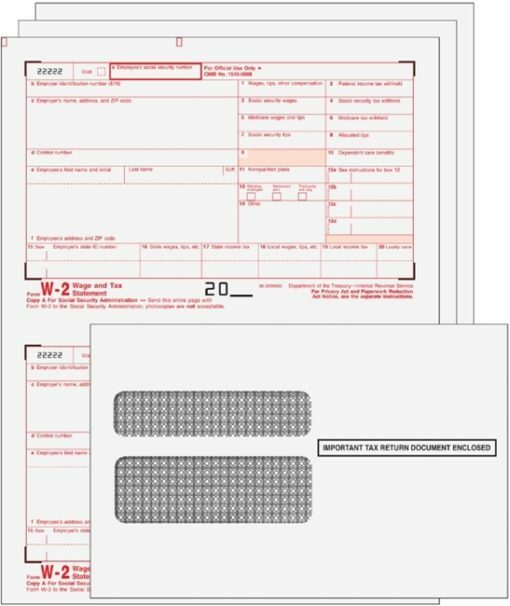 These forms are the Official W-2 Format, with 2 of the same form on each sheet. One W-3 Transmittal Form is included. Choose self-sealing or moisture seal envelopes. Click the “How to Choose the Right W2 Forms” tab above to learn more about which forms are right for your business. Your Accounting Software: Print W-2 forms compatible with your software, such as QuickBooks®. 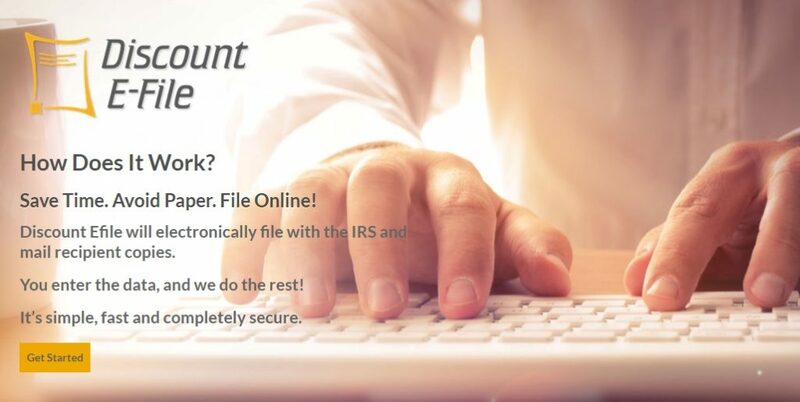 Specialized W-2 Software: Print and e-file W-2 forms if your accounting software does not. Online W-2 Filing: Enter or import data and we print, mail and e-file for you! Employee copies may be printed in a 2up, 3up or 4up format (2, 3 or 4 forms per page; also called ‘condensed forms). All of the copies for a single employee will print on one page. You simply fold and mail – no need to separate and collate forms! Your software may support these formats, be sure to check its functionality before ordering. The number of parts you need is determined by which government agencies you are reporting to. When using condensed 2up, 3up or 4up forms, you can print all employee copies on a single sheet to save time. For a 4-part form, use 2up paper. For a 6-part form, use 3up paper. For an 8-part form, use 4up paper. For EASY FILING OF LESS THAN 50 W2 FORMS, an online system is a better option than printing forms. Enter data online and we do the work for you for only $3.95 per form. Visit DiscountEfile.com for more information. Transmittal W-3 Forms are required only if you are printing and mailing W2 Copy A to the Federal Government. One W3 is required to summarize all W2s for one employer. 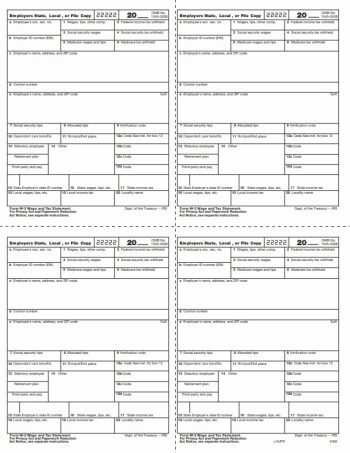 Order W-3 Forms. These are federal deadlines. Most states follow the same dates.